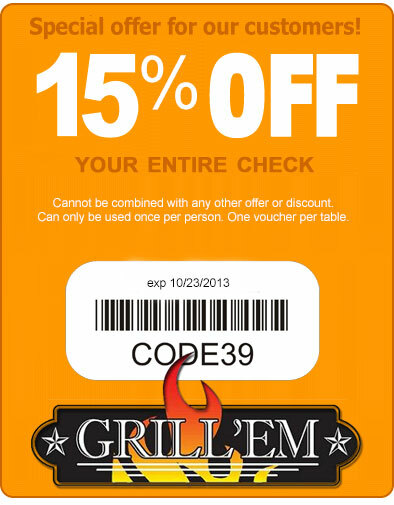 Download your 15% OFF voucher below. Share this awesome deal to unlock more rewards. Every person you get to sign up, you unlock 1 point to be used to unlock yummy rewards. Download 5 Total Points To Unlock! 0 More Points To Unlock! Download 10 Total Points To Unlock! 0 More Points To Unlock! Download 20 Total Points To Unlock! 0 More Points To Unlock! Developed by tru2mobile for Grill Em' Steakhouse. All Rights reserved.